If you're not into glitter and tulle, we've got just the dress for you this prom season. Olivia Mears is a costume designer from North Carolina who not only creates dresses out of Taco Bell wrappers and toilet paper, she also makes gowns good enough to eat. 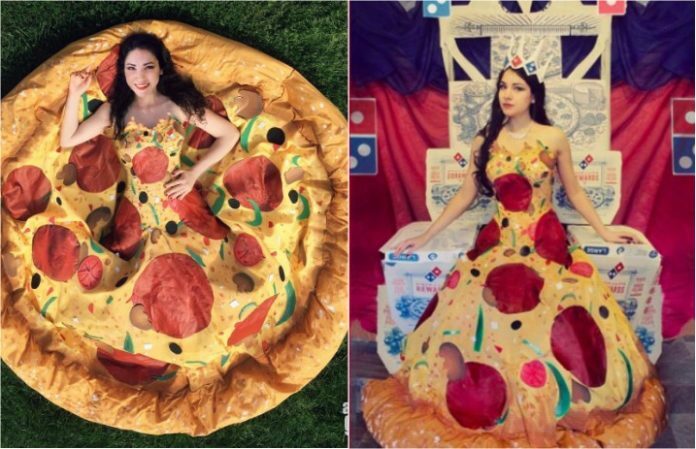 You may remember her “Taco Belle” dress that made the rounds last year, but she's back at it again with a pizza dress. Mears designed the pizza dress as an entry for Domino's Piece of the Pie contest, which rewards winners with shares of stock and $10,0000—Mears ended up winning the grand prize. See her awesome design below and try not biting into your screen. Also, check out her Instagram, avantgeek, for more. I created a dress that dreams are made of. If only I'd had this for my prom. ✨✨ #pizzadress made & worn by me.